With smartphone owners shooting more video than ever before, video recording capabilities in phones are becoming ever more important. They're a key feature of the LG V30 – and its camera just got a huge endorsement from a pro film maker. 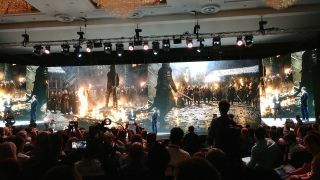 David Franco, director of photography for high-profile shows including Game of Thrones and Boardwalk Empire, talked about the smartphone on stage at IFA 2017, and he couldn’t speak highly enough about it. "When I don’t have a camcorder or DSLR I use my smartphone to film, but they often don’t have the quality," said Franco, who appeared at the smartphone’s launch event in Berlin. "I was intrigued by the V30 having cinematic capabilities, and was able to use it to shoot my daily life – my kids, my family – with the V30 before anyone else. "I’ve got to say its video capability is top-notch. It definitely impressed me." The V30 makes use of a 16MP sensor with a f/1.6 aperture lens, and has a 6.0-inch 18:9-ratio OLED display. But it was the camera software features that really caught Franco’s attention. Franco had particular praise for the V30’s Cine Effect mode, which lets users quickly recolor video they've shot to a professional quality, spending a considerable chunk of time describing how it let him create clips to his exacting standards. "With Cine Effect mode you can create rich, high-quality videos," he said. "It allows users to apply color palettes to create the kind of color scheme you see in movies. It can make your video look creepy and dark, or as bright and lovely as you like." Likewise, the LG V30’s nifty Point Zoom mode impressed the fantasy film maker. LG’s system, despite not having a pro-level zoom lens, is able to let a user pick a zoom point in a scene without as much distortion as you usually get with a digital zoom. "One of the elements that decrements video quality is zoom," Franco added. "Point Zoom does it smoothly and at a steady pace. It lets you select a zoom focus point that isn’t the centre of the screen too. It’s an impressive tool that anyone can use." With Game of Thrones season 7 now wrapped up, could the next season make use of the smartphones for filming? It may seem unlikely, but given Franco’s love for the LG V30, it may well be a greater possibility than before. It’s the sort of 'celebrity' endorsement usually reserved for the imaging abilities of Apple devices, and it makes us excited to see what the V30 is capable of. Check out our LG V30 hands-on for more on the new flagship.